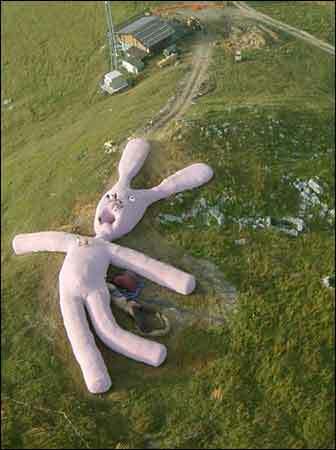 Gelatin, a Viennese art collective, comprised of Ali Janka, Florian Reither, Tobias Urban and Wolfgang Gantner have created a 200 ft long and 20 ft high stuffed pink bunny that is laying atop a hill in the northern region of Italy. "It's rotting away and the intestines are running out of its side, but it's really sweet," Mr. Janka said. It's especially nice if you're interested in the way things rot: grass has sprouted through the rabbit's knitted skin, it's beginning to ooze a brown liquid, and animals have foraged inside. Decay, it seems, is the whole point. "You climb upon the rabbit and feel like a maggot in its flesh," Mr. Janka said. "And then you are so happily transforming into a fly, and floating away." this must give the neighbors some pause. FLAK is hosting a second viewing of "Detroit @ 00:00:55" at the Detrot Film Center. 55 films 55 seconds long about Detroit created by artists, architects, videographers and students. Come out Saturday night, September 10th, to the DFC. Doors are at 7pm, film starts at 8pm. Look out for "Detroit @ 00:00:55 This Time It's Personal" winter '06. Call for entries out soon. The first annual REO Town Art Market will be held on the historic streets of REO Town in Lansing, Michigan. REO Town is known for its unique atmosphere, which combines a respect for culture and history and an acceptance for new ideas. This event will showcase a wide variety of Lansingâ€™s artists and musicians, as well as local businesses. This show is open to anyone who wishes to participate! This is not a juried show, just an opportunity for artists and musicians to exhibit their talent. We welcome all types of creative people, along with their friends and family. There is a $10 entry fee and a $5 table rental fee. Artists may arrive at 10:00am on August 20th to set up their tables. The Art Market will run from noon until 6pm. Spaces will be approximately 8ft. wide and will run along South Washington on the sidewalks. Spaces are first-come, first-serve on the day of the event. Artists who have special requests for space for a tent or a different exhibit space should indicate that when registering. Â· We are looking for a diverse array of vendors: fine art, crafts, food goods, jewelry, clothing, musicians, etc. Â· All work sold must be made by the artist selling the work. Megan Reardon of Organized Knitter crafted this knitted wig/hat to get rid of neon yarn. And although you won't be able to buy one, you can make one yourself. Megan posted detailed instructions on knitty.com. Josh Rubin says it reminds both of Anime and "Lego Land citizen wear". A little late for Halloween, but this is a darn cool do-it-yourself project for all you crafty OCC'ers. you can have mine. it doesn.t fit any more. EAST LANSING, Mich.- The East Lansing Art Festival is seeking fine artists, fine craftpersons and emerging artists for its May 21 & 22, 2005 Art Festival. This juried art festival, held in the streets of downtown East Lansing, welcomes 230 talented artists from across the United States and Canada and as many as 12 emerging artists affiliated (within 2-3 years) with any university, college or art school. Rated as one of the top art festivals in the country, the East Lansing Art Festival draws an estimated attendance of 70,000 from across Michigan and the Midwest region. In addition to our artist exhibitors, the Festival features free performances on two stages, an international style food court, and a hands-on art activities area. Admission for festival attendees is free. For more details, participation rules and applications, please visit our website at www.elartfest.com. If you are an emerging artist please click on 2005 emerging artist application link, and if you are a fine artist or fine craftsperson please click on 2005 artist application link. If you would prefer to receive an application in the mail please provide name and mailing address to: East Lansing Art Festival, 410 Abbott Road, East Lansing, MI 48823, or call (517) 319-6804. Please mention which application you would like to receive. Application deadline is January 14, 2005. "In the 1940s, Frances Glessner Lee constructed incredibly-detailed and spooky crime scenes in dollhouses to teach forensics to a homicide investigation seminar. The founder of Harvard's Department of Legal Medicine, Lee was named an honorary captain of the New Hampshire state police. nick- i think you made the link to this photo on flickr a private page. ArtServeMichigan.org is a good resource for Michigan-based artists. ArtServe Michigan supports and advocates for the arts and cultural education in the state of Michigan. ArtServe Michigan accomplishes its mission by working with artists, educators, cultural organizations, businesses, volunteers and others through statewide programs, services and a variety of collaborative efforts. Register online for Michigan Artist Directory's free monthly email listing of competitions, commissions, grants, calls for entries and job opportunities. Outside Circle co-founder, Ben Gaydos, installed his multimedia exhibit this morning at Marygrove College, in Detroit, Michigan. Sometimes he gets too bashful to toot his horn. Criticall Mass 2, is a juried exhibition organized by Flak Detroit, a creative collective much like Outside Circle. The opening performance is this coming Sunday and open for anyone who is interested in attending. Nice find Chad! Thanks for sharing. nice find chad. very interesting stuff. "Duane Hanson was actually not a great photographer. He was a great sculptor who created unbelievably realistic life-size sculptures of average Americans. The photos are his "sketches," used to create the sculptures. They are on display for the first time ever outside New York. This exhibit offers a rare window on Hanson's working methods and his sculptural journey into hyper-realism. More than 100 images represent the sum of his work and help structure an investigation on the relationship between photography, sculpture, art and life. "Bodybuilder" (pictured here) was created in 1989, and is part of the Cranbrook Art Museum Collection. Also on display during the photography exhibit is "Businessman Reading" (1983), on loan from the Collection of Gilbert and Lila Silverman." OCC's second annual weekend retreat, Fort Unit-Sun, will be on fifteen wooded acres outside the small village of Fife Lake, Michigan, late August or early September. We hope to time things so that we are there in the midst of northern Michigan's dramatic autumn color change. Stay tuned for more details. There is exciting potential in the use of homemade musical instruments. There was a time in distant history when a musician began their career by fabricating their own instrument. Over time, instrument building has become its own specialized profession. Kind of like the origins of the picture frame. Originally the gilt alcoves and shrines that religious paintings were displayed in, ornate frames then evolved to be carved by the painters themselves. Over time, it became its own separate specialization. One that is still boxing us in. What I want to know is: Have you ever designed, built, played, or recorded your own instrument? Do you know of artists or ensembles that perform on handbuilt instruments? And, are you interested in developing such an ensemble? nick is your "pen click" song up on the web? Open Decks : just ask! those that i talked with were quite interested in OCC as well as creating a dialogue between the two groups. they welcomed OCC's publication, jowai, and encouraged us to enter films in their film festival, and welcomed submissions for exhibition. but do they toss the caber?